Around the corner, around the world, our mission efforts mirror the caring of Christ for all. Lakewood Presbyterian Church supports a wide variety of mission and service programs near and far, helping them in their specific efforts to transform the world. This mission partner was founded in 1982 as an effort on the part of 12 Lakewood churches to establish a hunger center. Our church is proud to have been a charter member. This center has grown to include job assistance, housing advocacy, and social services in addition to hunger issues. This non profit human services agency helps clients move towards self sufficiency through many different avenues. Community Corner is one of 3 WSEM sites that together provide 750,000 meals per year. We are very excited to support the Dougbe River School which was founded by Isaac Monah and other members of Noble Road Presbyterian Church in Cleveland Heights, Ohio. Isaac grew up in the Dougbe River area and then immigrated to the U.S. It is a remote area and does not have electrical power. With Presbyterian financial support and God’s blessing, a modest school was built on 150 acres of land donated by 12 local districts and their people. There are now six teachers and 150 students. The land is being developed to grow food for the students and also as a for profit venture to support the school. A cafeteria and dorm are in the planning stages. This program is a collaborative effort between Lakewood City Services and Lakewood Schools. It provides meaningful community service opportunities for middle and high school aged youth. This inner city church is a vibrant ray of hope to the surrounding community year round. But their summer program of games, crafts, field trips, Bible study and good fellowship/ supervision to the area children is extra important. This mission oriented inner city church provides a weekly meal after Worship for all who have come. It is a time for addressing hunger of the body and soul. 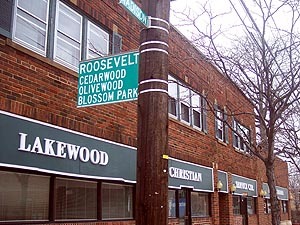 This faith-based charitable clinic located on Detroit Avenue in Lakewood serves eligible patients in greater Cuyahoga and also eastern Lorain counties. The need grows every year. It is currently estimated that it costs $78,600 to educate a Master of Divinity seminary student. These men and women are the future of church leadership and need our financial support.